Leo Politi was born in Fresno, California in 1908. At age 6, he and his family moved to Italy where he began his art training at the Royal Palace of Monza. He returned to Fresno and launched his literary career in 1938 with "Little Pancho". In 1950 he was honored with the Caldecott Medal for "the nation's most distinguished children's picture book" for "Song of the Swallows". Over the years he wrote many more widely-acclaimed books and achieved worldwide fame prior to his passing away in 1996. A public library, a park, a plaza and an elementary school have been named for him. The Centennial of his birth saw many commemorative celebrations in California and the nation. Want to read more about Leo Politi, Centennial year programs and events, and the communities response to all the festivities? Click here to see a variety of blogs and articles written about the Centennial. Copy of the program from the Official Kick Off event. California’s Assistant Majority Leader Kevin De Leon, who represents the 45th Assembly District is sponsoring a Leo Politi art exhibit in the California State Capitol Museum. The exhibit will run from August 1,2008 through August 17, 2008. The title of the exhibit is “Leo Politi’s Children of Los Angeles". The exhibition is part of a nationwide centennial celebration of the artist, muralist and award winning Children’s book author & illustrator, California native, Leo Politi was considered a pioneer in the children’s book field with over twenty books that tenderly introduced children everywhere to California’s multi- cultural heritage and diversity. The Department of Cultural Affairs, City of Los Angeles in May celebrated artist, muralist, author, illustrator, Leo Politi and his 2008 Centennial with a feature article in DCA's Asian and Pacific Islander American Calendar. The article spotlights Politi's children's books, "Moy Moy", "Mr. Fong's Toy Shop" and "Mieko". In addition to his Chinese American and Japanese American artwork there are also examples of Leo Politi's Korean American and Philippine American art. The calendar spotlights many of the hundreds of planned 2008 events celebrating Leo Politi, a Los Angeles treasure and his Milestone Centenary. "THE SONG OF THE SWALLOWS"
"PEDRO THE ANGEL OF OLVERA STREET"
LEO POLITI ELEMENTARY SCHOOL "Million Word Challenge"
In conjunction with their annual awards luncheon California Readers celebrated The Leo Politi 2008 Centennial. Every year the California Readers presents their Annual Golden Leo Politi Award to a California Author. The Centennial was even more special to the 2008 recipient as there were many Leo Politi surprises. All teachers, librarians, authors, illustrators, parents, book lovers and Leo Politi fans were anxious to attend on February 23, 2008 at the Pickwick Gardens, Terrace Room. The City of South Pasadena takes great pride in the Leo Politi Mural at the South Pasadena Public Library which is considered a city treasure. As part of the Leo Politi 2008 Centennial Celebration the South Pasadena City Council placed on the February 22, 2008 agenda, an item to proclaim February 28, 2008 LEO POLITI DAY IN SOUTH PASADENA. THE LEO POLITI ELEMENTARY SCHOOL "Friends Around The World"
The rededication ceremony was on Wednesday, April 1st, at the historic landmark Biscailuz Building on Olvera Street. The El Pueblo Park Association had recently completed the restoration of the Los Angeles treasure, "The Blessing of the Animals" mural, by Leo Politi along with an anti-graffiti material applied on top of the finished coat. The rededication of the mural was one of hundreds of Centennial celebrations that took place across the nation and will continue throughout his 100th year until what would have been Leo's 101st birthday on November 21, 2009. For many years the people of Olvera Street have celebrated the Blessing of the Animals. This centuries old tradition dates back to the fourth century when San Antonio de Abad was recognized as the Patron Saint of the Animal Kingdom. In those days the people would take their animals to the Padre to receive a blessing and to ask for fertility and health. The ceremony is held in grateful recognition of the tremendous services given to the human race by animals. The Blessing of the Animals is held on the Saturday before Easter, Sabado de Gloria, the gaily adorned animals and their owners start assembling in the Plaza. A procession, led by the Merchants of Olvera Street, starts promptly at two o'clock and winds its way past the platform where the Bishop or Padre will bless each animal and person as they go by. The cow, decorated with flowers, heads the procession. She goes first because she is the animal who gives the most to mankind. The Father chants the Benediction: "Almighty Father, we bless these animals for all they have done in supplying our food, in carrying our burdens providing us with clothing, companionship and rendering a service to the human race since the world began". 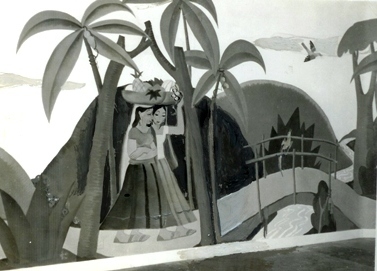 In 1974, thanks to a donation by the Filippa Pollia Foundation, Los Angeles artist and muralist Leo Politi was commissioned to paint a large mural on the Biscailuz Building. Leo Politi was no stranger to the oldest street in Los Angeles. His love affair with Olvera Street started in the early thirties when he painted portraits, sold his paintings and sculptures in front of the El Paseo, where he was discovered by Script Magazine who named him "The Artist of Olvera Street." 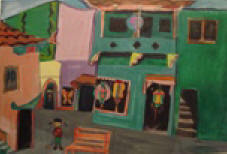 Also two of the twenty one children's books that he wrote and illustrated are centered on Olvera Street. Both of which were named Honor Books. For the subject of the mural he chose "The Blessing of the Animals," and Politi included many of the people who participated in the ceremony over the years: a blind harp player who performed the song "La Paloma" during the sparsely attended processions during the 1940's; a tall thin violinist who regularly played on Olvera Street and was the basis for the grandfather in Politi's classic children's book "Pedro, the Angel of Olvera Street"; a lady with poodles who worked in a booth on Olvera Street; and Emmet and Oscar - Politi's own dogs under the stairway. The mural also portrays Politi's observations made while executing the piece, including the sparrows that fed at his feet on quiet days and a baby, which he depicted in a basket on a donkey's back. Painted with acrylics, these memories and observations are expressed in Politi's highly individualized and distinctive style that captures both simplicity and gentility. Like all of Politi's murals, he uses no helpers and all of the work is his own including the carving of the door and the mosaic tile work. On April 4, 1978, Cardinal Timothy Manning, blessed and dedicated the mural. Everyone is invited to bring his or her animals and pets to take part in this colorful procession and to receive a blessing. Focal (Friends of Children and Literature) presented a Leo Politi celebration, in honor of the Leo Politi 2008 Centennial Year, enjoyed special guest readers and children activities. This event was located at the Central Library, 630 West 5th Street, Downtown Los Angeles (Children Literature) on February 3, 2008. The Million Word Challenge is an annual Los Angeles County-wide literacy campaign promoting a culture of literacy at home and academic achievement at school, culminating with the annual Feria del Libro:A Family Book Fair. The initiative challenges students to read millions of words outside of the classroom. This campaign is a partnership between the City of Los Angeles, First 5, Families In Schools, the Los Angeles County Office of Education, and the Los Angeles Unified School District with supporting sponsorship from La Opinion, NBC 4, T52, Target and Washington Mutual. Each participating school will have the opportunity to select one student to receive a $50 gift certificate valid for purchasing books at the Feria del Libro: A Family Book Fair, held on June 7, 2008. Student winners will be announced at the end of May and be recognized by their local schools. This year, the Million Word Challenge honored the Legacy of Author/Illustrator Leo Politi and celebrated his Centennial by staging the Million Word Challenge Kick-Off at Leo Politi Elementary School on February 21, 2008. Saturday, March 29, 2008 in honor of “The Blessing of the Animals” festival at Olvera Street, there was a reading of the Leo Politi’s books “Saint Francis and the Animals” and “Emmet” at the library accompanied with a related craft. Animal crackers were served. Just across from the Biscaluz Building at the plaza of Olvera Street is the Leo Politi tree. Dedicated on May 5, 1984 to honor the well loved author and artist in recognition of his love for the city of Los Angeles and the children he depicted in his award winning books. On April 8, 2008, author and Leo Politi biographer, Ann Stalcup gave a thirty minute presentation at Taft High School. Her audience was fascinated to learn more of the ethnic areas of downtown Los Angeles that had inspired and influenced Leo Politi's work. Ann's presentation was part of Taft High School's "Passport to Learning". On April 15,2008 a presentation was given to Castelar Elementary School’s Fifth Graders under the direction of their teachers, Susan Dickson, Diane Manke and ex-principal Dr. William Chun-Hoon, and in conjunction with the Friends of the Chinatown Libarary. The students had been studying Leo Politi’s connection with their school. The fifth graders competed in writing essays interpreting what they felt Leo Politi intended to convey with his multi-ethnic mural painted on a wall at the entrance of their school. The winning essays were written by Engleap Leang, Ashley Thompson, Judy Chen, Ivy Hong, Ricky Hoh, Sammi Wu, Sandy Ho, Michelle Yu, Tiao Li, Alejandra Zazueta, Timlan Wong, Yean Ly, Becky Gee, Raymond Chan, Jenifer Cai, Danny Melendez, Raina Mark, Mei Chen Lin. Engleap Leang and Ashley Thompson read their essays to the group following an Ann Stalcup talk and slide presentation on Leo Politi. THE LUGONIA ELEMENTARY SCHOOL'S "LEO POLITI WEEDS GARDEN"
The Lugonia "Forget Me Not" Garden in Redlands, Ca. was created in 1998 by now retired Lugonia Elementary school teacher Diana Holly and her 5th grade class. This garden provides students, parents, and the community a place to get acquainted with nature and it enhances the school campus environment. Since its inception, the garden has been a focal point of pride, beauty, and knowledge, not only for the School but for the entire Redland's community. The Smiley Library commissioned a stained glass window to pay special tribute to the Lugonia "Forget Me Not" Garden. The Garden has inspired other Redland's Schools to create their own gardens. For a decade now, the students have been reading Leo Politi's books in the Garden. One of their favorite stories is from Ann Stalcup's book "Leo Politi, Artist of the Angels." This story tells about the weeds in Politi's yard. Leo Politi found these weeds to be so beautiful and decorative and was saddened when his son had cut them down before he could capture their wondrous beauty on paper. The students wanted to celebrate Leo Politi's centennial by creating garden full of those wondrously beautiful and decorative weeds. The Leo Politi Weeds Garden was a perfect way to honor the life of Leo Politi. The Friends of the Watts Towers Art Center and the City of Los Angeles Department of Cultural Affairs proudly present "The Watts Towers 50 Years Inspiring Art". The Towers are not only a Great American, Californian and a Los Angeles Treasure but as Artist Leo Politi said in his 1967 Best-West Publications book, The Poinsettia, "The Towers, I believe are among the most exciting works of architecture of this century" ..."Though we associate the towers with an Italian emigrant, they are also a product inherent to the life and people of this community. The people here are composed mostly of poor Negros and some Mexican-Americans. They take pride in the towers and look at them as a symbol of hope, light and guidance." Included in this exciting event will be eight Leo Politi paintings, painted at and inspired by his many visits to the Towers. Also included in this important exhibition will be the artworks of over forty other artists. Exhibition dates were August 23, 2009 to January 17,2010 at the Watts Towers Art Center, Noah Purifoy Gallery, Charles Mingus Youth Arts Center and Mingus Gallery. On October 10, 2009 at the Watts Towers Art Center there was an Artist Reception as well as an Artist Panel, moderated by Cecil Ferguson, Community Curator. There was also a History Panel on "The Stress Test" moderated by Dr. Luisa Del Guidice, Ethnographer and Oral Historian. On January, 22, 2008 Linda Scambray of the Friends of the Leo Politi Library read "Little Leo" to the students of Wolters Elementary School. She explained to the students that "Little Leo" was a true story that started in Fresno and took place when when Leo was their age and how Leo Politi grew up to be a world famous artist and author. Linda encouraged the students to read more and also to write their own stories. Ivan and Rose Rowe, friends of Leo's friend Arnie Nixon, donated "Little Leo", "Juanita", "Pedro the Angel of Olvera Street" and Ann Stalcup’s biography entitled, "Leo Politi, Artist of the Angels" to the school library for Leo Politi’s 2008 Centennial. Wolters' librarian, Sandy Prieto, promised to calendar more Leo Politi book readings for the centenary with a special presentation to thank the Rowe family. On June 9, 2008, Ann Stalcup gave four presentations at Lockhurst Elementary School in Woodland Hills. One of the many welcome signs at the school said "Thank you for sharing Leo Politi with us." The librarian, Karla Forbes, had spent many weeks preparing for Stalcup's visit. She and the teachers had read many of Leo Politi's stories to the students. The school was festive with posters, and in the library, Leo's books were on display. One corner of the library had been decorated to look like Olvera Street. Many Mexican items were on display such as pottery, small blankets, dolls, cacti, and sombreros. Hanging above them were a piñata and papel picado streamers (paper cut-outs). A number of students had decorated shoe boxes to represent each of Leo's picture book stories. Theatre of the Puppets (formerly Teatro de los Puppets) for over 30 years has taught, mesmerized and entertained hundreds of thousands of students in schools and public libraries all over Southern California with their timely, educational puppet shows. On many, many occasions, Leo Politi sketched and enjoyed Theatre of the Puppets’ many productions, and especially The Reading Railroad with its puppet rendition of the book, "Pedro, the Angel of Olvera Street". Most memorable for Leo was a performance at the Open House at the Hollywood Bowl. After that perform-ance, Leo used to say with a big smile, “Pedro performed at the Hollywood Bowl…. and he sang like an Angel.” On January 26, 2008 for the Grand Open-ing of the Leo Politi 2008 Centennial at the Historic Landmark, the Pico House, Theatre of the Puppets Co-Founder Bill Sousa, Artistic Director Bob Stone, and two of Bill’s grandchildren, Michael Sousa Jr., and Sara Serrander Sousa gave a special performance of "Pedro, the Angel of Olvera Street". Bill came out of retirement to pay homage to the memory of his dear friend, Leo. 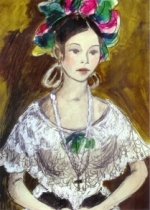 Sara, now a mother, as a young child was herself “The Angel of Olvera Street” for several years. Mark your calendars now, so that you don’t miss this most memorable day and historic performance. Come and see our beloved Pedro, his Grandfather, and other dear friends from this book “come alive”. Leo Politi Elementary School is thrilled to be part of the Centennial Celebration. After all Leo Politi's appreciation of books, art, and children is present in all we do. Our kinder-garten students will be counting down the days 'til January 26. The official kick-off of the Leo Politi 2008 Centennial. For our Leo Politi Centennial Festival, every class on campus will become experts on one Leo Politi book and will create a project celebrating his work. Our older students will get to know "Leo Politi's Los Angeles," from Olvera Street to Echo Park. Also, there will be other ways that we will celebrate Mr. Politi's centennial, but the students say, "for now, they are TOP SECRET." MOY MOY'S BROTHER FRANK YAN REVEALS "THE WISHING WELL INCIDENT"
Esteban Coronado and his adult group, Ballet Coco, along with his children’s group, Ballet Fiesta, has for many years been an integral part in developing the growth of diverse cultural events in Southern California. He is credited with playing a key role in maintaining traditional culture in the “Los Angeles Performing Arts Scene.” For close to thirty years Leo Politi was one of Esteban Coronado’s most loyal fans, attending all of Ballet Fiesta’s dance performances. Coronado even made an exception and allowed Leo Politi to attend rehearsals and sketch the dancers. On January 26, 2008 at the Centennial opening at the Pico House, Esteban Coronado and his Folklorico dance troupe “Ballet Fiesta” celebrated the Leo Politi 2008 Centennial with a special performance for his long time friend and fellow artist. During the month of January 2008, the Chinatown Branch Library celebrated the Leo Politi 2008 Centennial with three displays on the Caldecott Medal award. One display case exhibit featured a collection of Caldecott Medal Award winning books, with a “special” tribute to the just announced 2008 Award winner. This special exhibit spotlighted Leo Politi’s award winning books, plus "one of a kind documents" on loan from his family. One of the highlights of this special exhibit was Leo Politi’s original paintings from "Song of the Swallows" along with the actual Caldecott Award Medal. The Chinatown Branch Library, as part of their Chinese New Year Celebration, exhibited some of Leo Politi’s Artwork on Chinatown’s community. The “Special Two Day Exhibit” on Friday and Saturday, February 8 and February 9, 2008. was attended by members of the Leo Politi Family. They were at the library to meet the public and answer questions about the Leo Politi 2008 Centennial. Also, during the month of February, there was a reading of Leo Politi’s book "Moy Moy" by Mary Joe who is the original Moy Moy for whom the book was based. The reading was followed by a craft activity by GAB volunteer Marge Lew on how to make a fantastic Chinese dragon out of beads, pipe cleaner and curling ribbon. Levi Bischof, Leo Politi's great grandson, sitting with the pumpkins at Harmony Farms Country Store in Mountain Center, California. Harmony Farms is a family run business where people come for farm fresh eggs, wild bird feed and gifts for their friends and family. As we celebrate Leo Politi's Centennial, Harmony Farms is proud to be selling his beloved books and postcards of his artwork. All are welcome to join us in celebrating this momentous event and admire the treasures Leo Politi has created for all to enjoy. Mission San Juan Capistrano on May 3, 2008 combined their popular "Battle of the Mariachis" with a special one day Leo Politi art exhibit to help celebrate The Leo Politi 2008 Centennial. In 1950 his book "Song of the Swallows" that was set at Mission San Juan Capistrano was awarded the coveted Caldecott Medal. To help celebrate The Leo Politi's milestone centenary, his family hand picked from his over sixty years of sketching on Olvera Street, his most festive paintings. The art together with the wonderful and authentic Mariachi music at the Jewel of the Missions setting, was an art exhibit not to be forgotten. On May 10, 2008, under the sponsorship of the Literary Guild of Orange County, the 15th Annual Festival of Women's Authors participated in the Leo Politi 2008 Centennial by presenting Ann Stalcup, author of "Leo Politi, Artist of the Angels", as one of the eight featured speakers. Ann was the events only Children's Book Author. She gave a talk and slide presentation on the "Life and work of Leo Politi". The event was open to the public, but attendance was limited to 500. Registration began in late February and filled very quickly. February 28, 2008: Leo Politi-themed tea party for Life Members of the Arne Nixon Center Advocates at the home of Denise Sciandra, ANCA president in Fresno, California. The Arne Nixon Center Advocates is the "Friends" group for the Arne Nixon Center for the Study of Children's Literature, a research collection housed in the Henry Madden Library at California State University, Fresno. It was established in 200l with a donation of 22,000 children's books and a $1,000.000 dollar endowment from Professor Arne Nixon. Leo Politi's books and artwork are an important part of this collection. Once a year, ANCA has a special program to show its appreciation of its Life Members. In this centennial year of Leo Politi's birth, they decided to honor Leo. Thirty-five Life Members gathered at the Sciandra residence that was transformed into an English tea room. On each table was a potted plant in a planter decorated with Politi artwork. A vase decorated with his artwork and filled with a blossoming branch was centerpiece on the food table. Bookmarks hung from it that were created for the occasion with a picture of Politi's "Three Little Girls in Pink". The china cabinet was filled with Denise's Politi books, artfully arranged among pink blossoms. To end the afternoon, Denise showed a PowerPoint slide presentation featuring Leo Politi's stories set in Los Angeles and including personal photos taken in Los Angeles of Politi on Olvera Street during The Blessing of the Animals, Angel's flight, Politi's home on Edgeware Road and the sidewalk that he decorated with mosaic tiles. As part of the celebration of Leo Politi's 2008 Centennial, Long Beach Librarian Suzanne McMillan, has donated to the Politi family the painting of "Poncho" and his little dog. The Politi family gratefully accepted the painting and has named it "Poncho from Long Beach" and named the dog, "McMillan." The family will take "Poncho from Long Beach" and McMillan" to their favorite framer for "Poncho from Long Beach" to pick out a frame that he feels at home in. (If "Poncho from Long Beach" would like matting, he may also choose matting.) Once "Poncho from Long Beach" is framed, the Politi family will make arrangements with future event organizers to display "Poncho from Long Beach" and his dog "McMillan." Where they can then look forward to meeting Leo Politi fans. Leo Politi's long time close friend Jack Weiss, released one hundred white doves as part of the Los Angeles City's dedication of Leo Politi Square. Weiss selected one hundred doves, symbolic of Politi's love of nature and his one hundred year birthday. Ninety eight doves returned home safely and two doves chose to remain at the corner of Sunset Boulevard and Echo Park Avenue to watch over Leo Politi Square. The City of Los Angeles, Department of Public Works and the Public Affairs Office, in the spirit and commitment to keep Los Angeles beautiful, have granted The Leo Politi Neighborhood Association, in the historic Westmoreland Place neighborhood bound by Hoover, Pico, Vermont & Olympic, another 27 trees that were planted to further beautify the neighborhood. The project was completed in time for the Leo Politi 2008 Centennial Celebration. In celebrating the Leo Politi 2008 Centennial, the nonprofit Angeleno Heights Trolley Line, Inc. dedicated a special plaque on one of the antique trolley seats that will be used on their vintage streetcar. The plaque will read, “Leo Politi – Preservationist”. The group's goal is to restore an original trolley car that they own and return vintage trolley service to their historic Angeleno Heights neighborhood. As part of their fund-raising activities they were selling a limited edition print of Leo Politi's painting of the trolley car from his art book entitled, “Angeleno Heights”. May 17th and 18th, 2008. "Characters will come Alive" In honor of Children's book author and illustrator Leo Politi's Centenary. As part of the children's summer reading club of the Robertson Branch of Los Angeles Public Library. "Moy Moy", from Leo Politi's classic children's book, steps out of the pages to entertain us with some magical stories of her own. This year would have been author and illustrator Leo Politi's 100th Birthday. The event was held , July 10 at 1719 S. Robertson Boulevard, Los Angeles, California 90035. The Centennial Room Display cases in The Pasadena Central Public Library featured some of Leo Politi's Victorian architecture artwork for the month of May and June. The exhibit spotlighted three of Politi's books that dealt with victorian architecture in Southern California. The exhibit featured original artwork and writings from Leo Politi's books on Bunker Hill, Angeleno Heights and Redlands. 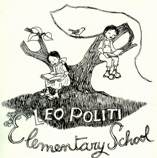 2008 is the Leo Politi Centennial year. It was the first time his original artwork from all three books were viewed by the public at the same time. Each book's artwork was on special exhibit in 2008. This Centennial Room exhibit served as preview to all three "must see" exhibits. Koehnline Museum Celebrated Leo Politi with a seven-week celebration of works by international artist and author Leo Politi (1908-1996). It went on display Thursday, May 8, at the Koehnline Museum of Art at Oakton Community College, 1600 E. Golf Road, Des Plaines. Leo Politi: Mexican Images of Olvera Street is an exhibit of Politi's gouache drawings, carvings, and books from the 1930s and 1940s. Born in Fresno, California, Politi was a child when his family moved to Italy, where he studied art. Upon his return to Los Angeles, Politi began capturing the images of Mexican immigrants who settled in the Olvera Street district. The public was invited to a free reception with refreshments, Thursday, May 8. This free exhibit was part of "Leo Politi 2008 Centennial" events, and ran through June 26. www.oakton.edu/museum. For the month of June 2008 the Parker Branch Library of the Douglas County participated in the Leo Politi Centennial with a special exhibit of the Leo Politi Caldecott Medal Award book "Song of the Swallows". The exhibit contained original illustrations from the book as well as the coveted Caldecott Medal on loan from the Leo Politi family. In addition to the Caldecott Medal, The Regina Medal awarded in 1966 to Leo Politi by the Catholic Library Association was also on exhibit. In the month of June, 2008 the Glendale Public Library celebrated The Leo Politi’s 2008 Centennial with a special display of many of his children’s books . The exhibit included original artwork and sketches from some of his books. Included in the large display case exhibit were one of a kind items on loan from the Leo Politi family that would educate our young readers to some of the steps taken by Mr. Politi in creating a book. On March 7, 2008 the Los Primeros Magnet School became part of the Leo Politi Centennial as author and Leo Politi biographer, Ann Stalcup spoke at two assemblies. Ann's talk on Leo Politi was followed by a question and answer period. Later a wonderful lunch was prepared for Ann and the teachers by the P.T.A. Fresno County Library. This is the year to celebrate two of the Valleys most beloved authors; Leo Politi and William Saroyan. Fresno County is leading an international celebration of Saroyan and is also participating in a nationwide celebration of Politi. Valley organizations will join the library in hosting a diverse array of local special events honoring the 100th anniversary year of their births. Chinese New Years party. CSUF Radio Station KFSR 90.7 interviewed Librarian Jeanne Johnson and Linda Scambray on the Leo Politi Centennial scheduled for broadcast on August 30th and August 31st. You can also listen through their website at www.kfsr.org after Friday, August 30th. Jeanne Johnson and Linda Scambray discussed the Leo Politi branch library as well as the Leo Politi 2008 Centennial. The Torrance Public Library celebrated The Leo Politi 2008 Centennial on Saturday. September 6, 2008. Author Ann Stalcup discussed the life of artist and children's book author-illustrator Leo Politi, (1908-1996). Ann Stalcup gave a lecture on Leo Politi's unique vision of Los Angeles, and how his work developed into an iconic representation of places such as Olvera Street, Chinatown, Bunker Hill, and Mission San Juan Capistrano. The Friends of the Torrance Library Annual Meeting and election of Officers preceded this informative program. Reservations were not required and refreshments were served. Ann Stalcup's book, "Leo Politi: Artist of the Angels", was available for sale at the event along with other examples of Politi's work. On September 13, 2008, the Santa Monica Public Library celebrated the "Leo Politi 2008 Centennial" with special events and displays. Ann Stalcup author of "Leo Politi, Artist of the Angels" presented a slide show and lecture on Mr. Politi, and autographed her book as part of the Leo Politi 2008 Centennial celebration. The Torrance Public Library presented a story and craft event entitled "Parade of the Animals." Children of all ages were welcomed to join artist Peggy Hasegawa to hear stories from Leo Politi's children books and to make a craft based on the parade and "Blessing of the Animals" the annual event at historic landmark Olvera Street in Los Angeles. The event took place,September 19, 2008 at Katy Geissert Civic Center Library, 3301 Torrance Blvd.,Torrance. No registration was required and all material was provided. Marge Bitetti in her "new" Arcadia Book entitled "Images of America", Italians in Los Angeles" was one of the first to acknowledge the Leo Politi 2008 Centennial. In her book Bitetti devotes eleven pages to Politi and his art, including his acclaimed mural "The Blessing of the Animals" and painting of Simon Rodia's "Watts Towers". For close to 60 years, Politi's paintings (and books) celebrated Los Angeles's rich cultural diversity. Included in the book are paintings of Angels Flight, Chinatown, Little Tokyo, Olvera Street and Bunker Hill. special tribute presentation about the life and work of Leo Politi, followed with a book reading. The presentation was audio-visually supported and bilingual, with the participation of members of the Leo Politi family. The event was organized by Cervantes Center of Arts and Letters in conjunction with the Politi family and the Huntington Park Public Library. It was followed by a reception. Leo Politi spent many hours at Mission San Juan Capistrano doing research and creating the characters of his Caldecott Medal winning, "Song of the Swallows". Paul Politi says that his father had many wonderful memories of the Mission. He shared some of these memories with the Mission Docent Society on Thursday afternoon, October 23, 2008, in the Mission's Soldiers Barracks. This date coincides with the feast day of St. John of Capistrano, and is the day that signals the return of the famous swallows to their southern home in Goya, Argentina. A quote from the book: "Farewell, Golondrinas, For you will we yearn, May God bless your Journey, And guide your return." The public was invited with paid admission to the Mission. Please visit their web-site for more information: www.missionsjc.com. Mission Preservation Society members are admitted free. On Friday, October 31, the Community Altars was raised in the Plaza area. Leo Politi had his own altar in a designated space. Leo's son Paul, along with the Olvera Street Merchants and friends were invited to build the altar in his memory. It stayed up until November 3rd. Fans and friends of Leo were asked for objects and photos that reflected Leo Politi's life. Every thing should be copies or replaceable items as the altars are up for three days. We have security but if there is something valuable that you want to share, be sure to have someone watch over it. Norma Garcia copied some of the jackets of his books and coordinated the various objects of the altar. On Wednesday November 5th, Ann Stalcup gave a talk for young adults and adults on the life and work of children's author/illustrator, Leo Politi. Ann is the author of the biography, "Leo Politi, Artist of the Angels". Ann's talk was illustrated by color slides and a book signing followed her talk. Leo Politi's 100th birthday was celebrated in November at two events at the Chinatown Branch Library. Friday November 7, 2008, Mary Yan Joe read Leo Politi's children book "Moy Moy", her true to life story set in Chinatown's Chung King Road during the community's celebration of Chinese New Year. And on Saturday November 8, 2008, Kelly, Gim Fong's daughter, read another of Leo's children's books "Mr. Fong's Toy Shop", a delightful story of the elder Fong and the children of Chinatown at the Moon Festival celebration on Chung King Road. In addition California State Senator Carol Liu presented some Leo Politi books to the Friends of the Chinatown Branch Library. Brecksville Center for the Arts joined the Leo Politi Centennial celebration. Located in Brecksville, Ohio, Brecksville Center for the Arts was part of the 2008 centennial by offering classes and workshops designed to celebrate Leo Politi's life and work. Their popular After School Arts Program brings art classes to elementary students in local schools. The instructor, artist Stephanie Sibits, will devote classes in 2007 and 2008 to the Leo Politi legacy. Artist/illustrator Amy Trosino will also celebrate the centennial by devoting classes in her "Story Art: Live in Tale Workshops" to the famous artist/illustrator. Art projects will be posted on the Brecksville Center for the Arts (BCA) website. Other art and literary activities are planned for the 2008 Centennial. The Encino Tarzana Branch Library remembered the centennial birthday of celebrated multicultural artist and author Leo Politi with a "Leo Politi Birthday Storytime" Tuesday, November 18th for ages K thru 3. Three of his memorable books were read, a fun chalk art activity was presented and refreshments were served. Leo's son Paul, was present and took questions from the audience. Some of Mrs. Wendy Hirota's kindergarten class from Nestle Ave. School in Tarzana really enjoyed the birthday event. On November 21, 2008, Leo Politi's 100th birthday, there was a celebration of the life of the author and artist. There were readings from his books; an exhibit of Politi's works and testimonials and memories shared from those who knew him including his son, Paul. A craft activity and birthday refreshments followed. On Leo Politi's 100th birthday, November 21st, The Tree People and Yahoo! participated in planting 33 new trees at the Leo Politi Elementary School campus. Some of the trees that were planted included California Sycamores, Incense Cedars, Western Redbuds, Australian Willows, Gingkos, Purple-Leaf Plums, Brisbane Box Pines, Tebebuias (yellow blossoms), Italian Cypresses and Ornamental Pears. In addition there was a special tree dedication to each class and also to Leo Politi's biographer Ann Stalcup. Leo's daughter Suzanne and son Paul, were on hand to participate and celebrate this very special day and event with the students and faculty. Principal Bradley Rumble said, "It was another one of those amazing days at Leo Politi Elementary School.....YAHOOOOOO" ! The Monterey Peninsula celebrated the artist, author and illustrator Leo Politi's Centennial as the Monterey Public Library hosted a lecture by author and Politi biographer, Ann Stalcup in the community room on Wednesday, November 19, 2008. Following Stalcup's talk, she signed copies of her book, "Leo Politi, Artist of the Angels." The public was invited to enjoy refreshments around the beautiful mural created by Mr. Politi for their Children's Picture Book Room. There will also be an exhibit in the lobby's display case that will tell the story behind the creation of the mural. The display included photos of Leo Politi, his sketches, letters from Mr. Politi and other items that gave an insight into the making of this treasured mural. The exhibit was installed on October 1, 2008 and ran through November 29, 2008. There are also plans for a special children's reading of "A Boat For Pepe" and "The Butterflies Come" two Politi books that are set on Monterey Peninsula. Once again Echo Park demonstrated another reason why in 2008 it was named in America Planning Association's "TOP TEN GREAT NEIGHBORHOODS" with their Annual Echo Park Community Parade. This year's theme was "Holiday Magic." 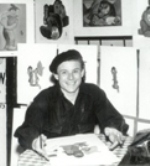 The late Los Angeles artist, muralist and award winning author-illustrator Leo Politi who would have been 100 years old this year, represented by his family was one of the three parade Ambassadors of the Annual Echo Park Community Parade. Politi was a long time resident of Echo Park. He authored and illustrated over twenty five books including his last historical art book "Angeleno Heights". Leo Politi also wrote and illustrated "Emmet" a true children's story about a homeless dog that is centered in Echo Park's Angeleno Heights historical district. Each parade participant stoped at the corner of Sunset Boulevard & Echo Park Avenue (Leo Politi Square) and were be presented a trophy and then continued toward Park Avenue. The "Holiday Magic" was held on Saturday, December 13th at Elysian Park Avenue. The Los Angeles Lakers are proud to announce December’s Teacher of the Month winners: Elizabeth Williams ,Brenda Lopez, Kathy Wallace and Student of the Month winners: Kelsey Klunder, David Lopez and Emily Werman. This month’s winners demonstrate an outstanding commitment to academia, athletics, and community outreach. .Elizabeth Williams, a 2nd grade teacher at Leo Politi Elementary School is a gifted teacher who provides well-planned and inspired instruction to her students. Her hard work has paid dividends for her classroom of economically-disadvantaged students. Over 90% of her students score “proficient” or “advanced” in language arts and math on state achievement tests. The Students and Teachers of the Month were invited to the home game on December 14th against the Minnesota Timberwolves. They were honored during a halftime presentation where they received a plaque and a $50 gift certificate to Staples. The nominations for the December Student and Teacher of the Month were submitted by principals and teachers of each school based on exemplary efforts, achievements, and extracurricular activities. (Far right) Elizabeth Williams of the Leo Politi Elementary School in Los Angeles. Don Shorts and Dee Fisher, proprietors of the Old California Store and long time admirers and supporters of Leo Politi, sponsored the opening reception at the Carnegie Art Museum entitled, "Leo Politi, Capturing the Heart". For years Don and Dee have sponsored Leo Politi art exhibits, "The Leo Politi art collectors group," and were co-curators for the 2005 exhibit, "Leo Politi, Artist of the Angels" at the Watts Towers Art Center. The Watts Towers exhibit was presented by the City of Los Angeles Department of Cultural Affairs in conjunction with the Italian Oral History Institute and was part of the Italians in Los Angeles Festival. The Carnegie Exhibit featured Leo Politi's early period (1930's and 1940's) often found in homes furnished with Monterey furniture. Serious collectors have credited The Old California Store as responsible for Monterey furniture becoming a California art form. The Leo Politi family, joined with the New Chinese Garden of glowing Fragrance that opened to the public in 2008. As part of Chinese New Years events in February 2009, Leo Politi's book, "Moy Moy" was featured in the program series. Also participating was Mary Joe who, as a child, along with her three brothers Frank, George and Harry was the real “Moy Moy” in Leo Politi's book. Book reading and book signings along with a variety of other activities were scheduled. The Leo Politi Centennial will run through November 26, 2009. The Carnegie Art Museum in Oxnard, California celebrated the Leo Politi 2008 Centennial with an exhibit entitled "Leo Politi, Capturing the Heart", featuring never before seen examples of Leo Politi's fine art. Included in the exhibit were paintings featured in his definitive monograph art book entitled, "Leo Politi, Capturing the Heart of Los Angeles". The exhibit ran from December 13, 2008 thru February 22, 2009. Ann Stalcup author of "Leo Politi, ARTIST OF THE ANGELS" spoke in The Park School Library on Feb. 11th where she was enthusiastically hosted by the school librarian. She spoke to Grades K through 5.
could not have been more welcoming. On February 19, 2009 in conjunction with the Carnegie Art Museum's exhibit of Leo Politi's early 1930's and 1940's artwork, Larry Bischof, co-author of the Angel City Press forth-coming full-color monograph "Capturing the Heart of Los Angeles" gave a presentation on the distinguished artist and illustrator. Larry, Leo's son-in-law, having closely known Leo for the last two decades of his life, contributed many personal insights about the famed and beloved artist whose paintings, illustrations and sculptures vividly articulate the multi-ethnic identity of Los Angeles. Larry assisted Leo on his 1980's Lummis Home exhibition. He has also helped to curate many Leo Politi Centennial art exhibits including the official centennial kick-off exhibit at the Pico House at the Historical El Pueblo de Los Angeles Landmark. Year 2008 was the centennial celebration of Politi's birth and was marked with numerous statewide and national exhibits and events. Bischof is an award winning Hollywood television and motion picture screenwriter whose credits include episodes for "The Waltons" and "Little House on the Prairie." In addition, Bischof produced the 1990's Leo Politi interview segment and the CD-rom "Mieko" which was produced in eight languages. Leo's children, son Paul and daughter Suzanne, were also present to answer questions regarding their father. California Readers honored the 2009 Leo Politi Golden Author, David M. Schwartz at their annual "We love California Authors & Artists" luncheon on Saturday, February 28, 2009, which was held at the Pickwick Entertainment Center, Pickwick Gardens, 1001 Riverside Drive, Burbank. Keynote Speaker was Susan Goldman Rubin. LEO POLITI ELEMENTARY SCHOOL RIBBON CUTTING FOR "NEW" PLAYGROUND!! Leo Politi Elementary School celebrated the installation of its new playground equipment for pre-K and Kindergarten students at a special ceremony on March 2, 2009. Paul Nisenbaum, who shepherded the project and LAUSD School Board President Monica Garcia joined hundreds of students, teachers and parents as they gathered to inaugurate the latest addition to this vibrant school community. The school's youngest students prepared banners and songs for their special day. In addition Paul Politi, son of Leo Politi was on hand to help celebrate the joyful day. On November 21, in honor of Leo Politi's 100th birthday, the Tree People and Yahoo sponsored the planting of over 30 trees. The tree planting continued all day with each class planting and naming their tree, and then being taught how to care for it. The classes each chose a name for their tree. Some trees were named after one of Leo Politi's picture books. The first tree (a Podocarpus Gracilior - Fern Pine) was planted in honor of Ann Stalcup, author of the biography, "Leo Politi, Artist of the Angels". Ann was presented with a certificate and flowers in recognition of her role in helping the students to come to know the man and his work. To celebrate and honor Leo Politi, the Children's Literature Research Collections installed a display showcasing some of his original material in the Kerlan Collection. This exhibit was viewable to all visitors to Andersen Library. The complete holdings of the Politi Papers are listed in his online finding aid. (http://special.lib.umn.edu/findaid/xml/CLRC-1761.xml) and are open to the public during regular business hours (8:30-4:30 M-F, appointments appreciated through clrc@umn.edu). The Kerlan Collection appreciates the generosity of Leo Politi and his estate and looks forward to future opportunities to share his delightful art. On April 17, 2009, the After School Garden Club at Lugonia Elementary in Redlands, Ca. hosted a reading of Leo Politi's book, "Moy Moy" by Mary Joe, the original Moy Moy that the book was based upon. The reading took place around the Leo Politi Weed Garden. The After School Garden Kids meet each Tuesday from 2:15p.m. to 4:00p.m. and are the primary caretakers of the garden. From planting to weeding they do it all. The kids all looked forward to and the planning for this very special event. Delightful audiences attended Ann Stalcup's three talks on her book,"Leo Politi, Artist of the Angels. " She was made to feel very welcome at the school and both children and teachers were extremely interested in Leo's life and work. The students were very responsive to the questions that Ann asked. On Tuesday, May 19, 2009 author Ann Stalcup spoke about the life and work of her longtime friend, Los Angeles author and artist Leo Politi at the Los Angeles Public Library, Platt Branch in Woodland Hills. Her book "Leo Politi: Artist of the Angels" was available for purchase afterwards. Paul Politi, Leo's son attended. This free program was co-sponsored by the Platt Library an the Friends of the Library. On Wednesday, Sept. 23, 2009 Paul Politi, son of Leo Politi spoke about the life and work of his late father to the membership of the Woodland Hills Rotary Club. Starting August 2007, the Pasadena Library, as preview to their 2008 Leo Politi Centennial Celebration, had a special Leo Politi exhibit throughout the library. All eight of the libraries display cases featured Leo Politi books, paintings, carvings and many one of a kind items. In addition only the work of Leo Politi was presented in the libraries portion of the Pasadena Art Night (L.A. Skin: Multicultural FESTIVAL) on October 12, 2007. The event is an on going partnership among many cultural institutions and the Cultural Affairs Division of the City of Pasadena. Tierra Blanca Dance Company presented their world premier dance tribute in honor of Leo Politi's stories and music in his books. Ann Stalcup, author of "Leo Politi, Artist of the Angels," and storyteller extraordinaire captivated the audience with a slide show and stories about Leo Politi's life and work. In addition, a special four hour "Art Night-Leo Politi" exhibit was presented by the Leo Politi family. Some may be surprised to learn that the Politi mural on display at the South Pasadena Library is significantly different than the one he originally painted in 1957 (for the sum of $200.00). When Leo was asked to touch up the original mural for the grand opening for the Library's 1982 expansion project, he characteristically took on the job without asking for a fee. He planned on spending only 2 or 3 hours, but ended up devoting weeks, almost completely repainting the mural in the process. The differences between the 1957 and 1982 paintings are rather striking. The earliest depiction features minimalistic youthful figures in muted tones, while the update is more contemporary with flowing lines and lush, bright green hues. Nevertheless, both versions capture the universal charm of children with books. In February, 1996 at the reopening of the historic Angels Flight Railway on Bunker Hill in Downtown Los Angeles, a frail, old artist...who many have called "The Artist of the Angels"-- stepped into Olivet, one of the two antique cars of the little funicular. It was only fitting that this Los Angeles treasure, artist & author Leo Politi, be the first to make the short journey to the top of Bunker Hill since he had so immortalized that hill in his books and artwork. Following his historic ride, hundreds of fans patiently waited in line as Leo Politi signed autographs. Politi would give each fan the time and respect he or she so deserved. Sadly for Los Angeles, Mr. Politi's own time would soon run out. Within weeks of the reopening of the railway, he passed away. In November, 2008, Leo Politi would have been 100 years old. As Los Angeles and the rest of the world celebrate Politi's life long work during his Centennial Year, the Angels Flight Railway Foundation is planning an art installation immediately adjacent to Angels Flight of large, weather-resistant, ceramic reproductions of nine Politi's paintings of Bunker Hill. As passengers ascend and descend on the 107 year-old Angels Flight Railway, they will have a glimpse into the City's past through Politi's depictions of historic Bunker Hill. The Foundation also is working on a complementary publication about Bunker Hill's history to be illustrated with Politi artwork. This Angels Flight project is one of many Southern California tributes to the life and work of Leo Politi. The mission of The Eric Carle Museum of Picture Book Art is to inspire, especially in children and their families, an appreciation for and an understanding of the art of the picture book. This most important and unique Museum, located in Amherst, Massachusetts has long admired Leo Politi's work and his importance to children's book art. The Eric Carle Museum has expressed a desire to honor Leo Politi for his vast contributions to the field of children's book art. The Leo Politi Family supports the mission of the Eric Carle Museum and is pleased to be partnering with the Carle Museum in future events. Leo Politi's love affair with Mission San Juan Capistrano dates back to the 1940's. Future San Juan Capistrano exhibits will feature "original illustrations" from Leo Politi's Caldecott Medal Award winning book "Song of the Swallows" that was centered at the Mission. In addition to the Caldecott Medal, the prestigious Regina Medal awarded to Leo Politi in 1966 by the Catholic Library Association will also be exhibited. The Regina Medal is awarded annually to a living exemplar of the words of the English poet Walter de la Mare, "only the rarest kind of best in anything can be good enough for the young," for continued distinguished contribution to children's literature without regard to the nature of the contribution. In the early 1970's The Lummis Home held an exhibit of Leo Politi's art. At the opening, Leo Politi said "This is one of the happiest moments in my life, to see my paintings hanging in such an aesthetic and harmonious setting. The Lummis House is California at its best." The Lummis Home will once again adorn Leo Politi's art. An exhibit is now being planned that will feature Leo Politi's Native American artwork, most of which has never before been seen in public. The Historical Society of Southern California will host this very special exhibit. Dates and times to be announced. Liz Reyes and her late brother, Los Angeles artist Teddy Sandoval, shared a love for Leo Politi’s work. Liz owns many Politi books and displays his treasured art in her home. In 1985, Liz ran into Leo Politi at Historical Angeleno Heights and Leo gave her permission to photograph him. In 2008, Liz had attended many Politi centennial events and has shared Leo’s photographs with his family, various libraries and schools. Liz plans to attend the Lummis Home exhibit, near the Museum Square Gold Line Train Station in Highland Park. The train station features her Late brother, Teddy Sandoval’s "Guardian” artwork. Liz Reyes will be bringing her family friends and art lovers to see, enjoy and experience the angelic spirit of her two favorite artists. Cardinal Timothy Manning once said "the artistic genius of Leo Politi is his gift of being able to penetrate the heart of a child and to reproduce in his works the innocence and loveliness of those who reflect the Kingdom of God." The San Fernando Mission is planning to present for the first time ever Cardinal Manning's personal collection of Leo Politi's Books with personal artwork. Artist and Muralist Julio Sanchez was commissioned to paint three murals at Leo Politi Elementary School in Los Angeles. Sanchez chose to salute Politi and his children books, by painting in Politi's early style. Julio Sanchez will paint a portrait of Leo Politi as his special tribute to the artist to be displayed at the school that bares his name. It will also be included in a future Politi exhibit being planned by some of Los Angeles' best Angelino Artists. Each artist will pay tribute to Politi's life and influence through their art. The exhibit is being organized by Los Angeles Photographer Jose Luis Sedano. The soon to be re-opened Angels Flight "The shortest railroad in the world" will join in the celebration of The Leo Politi 2008 Centennial. Leo Politi cut the ribbon and took the first official ride for the re-opening of Angels Flight and prior to his passing. Mr. Politi painted many wonderful paintings of Angels Flight including some in his book "Bunker Hill Los Angeles ".. reminiscences of by gone days. Rob Wagner, journalist and author of nearly two dozen books along with screenwriter Larry Bischof, Suzanne Politi Bischof and Paul Politi have written a coffee table biography book on Los Angeles artist, Leo Politi entitled "Leo Politi, Capturing the Heart of Los Angeles." 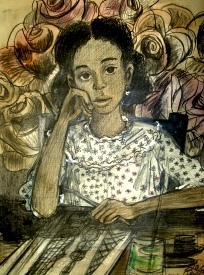 Though he is celebrated as an author and illustrator, Politi's lesser known but equally important work can be found in his early art, sculptures and murals. Readers will be treated to nearly 300 images of his work. The book will include his fine art, completed long before his fame as a children's illustrator. Featured images will include paintings on Bunker Hill, Chinatown, Olvera Street, Little Tokyo, and his many other picturesque hangouts. A majority of the paintings will be unpublished, never before seen art, mostly from private collections, as well as some rare clip art. If you study close some of the 20th Century's social, idealistic, and cultural advances made in Los Angeles, you will find the fingerprints of this humble, un-assuming man with a gentle heart. Leo Politi is considered an indigenous part of the California Landscape. The Friends of Edendale Branch Library are planning a Leo Politi art exhibit. The Edendale Branch Library features a large poigant Ernesto De La Loza mural that shows many of Echo Parks local treasures. Included in the De La Loza mural is the image of Echo Park’s long time resident, Leo Politi. Just a few blocks east of the Edendale Branch Library on Sunset Blvd. and Echo Park Avenue is “Leo Politi Square”. Elisabeth Waldo's multi cultural music and dance celebrates the diversity that inspired Leo Politi's art with an enchanted evening under the stars. View Elisabeth's collection of Leo Politi art and enjoy the music, costume and dance of many cultures. Experience the romance of old California, beautiful music and Leo Politi art as Elisabeth Waldo's Historical Rancho celebrates the Leo Politi Centennial. Experience the romance of old California, beautiful music and Leo Politi 's art as Elisabeth Waldo's Historical Rancho celebrates the work of Leo Politi. Leo Politi has continually supported “Feria De Los Ninos” the concept of using cultural arts to instill self- esteem, confidence, cultural pride and family respect through creative expression, discipline, training and achievement. Leo Politi’s support and poster artwork has been a part of the “Feria De Los Ninos” tradition. The Politi Family will join Los Angeles Department of Recreations and Parks by sharing their father's “Feria De Los Ninos” art work that celebrate the rich and diverse culture of latino speaking people. The alumni of Our Lady of Loretto Elementary School have a most interesting, and nostalgic website. They not only celebrate their school, church and community, but also the history of the neighborhood in and around Echo Park, and the City of Los Angeles. For years they have included Leo Politi and a huge example of his art on this wonderful website and soon they will add a tribute to Leo Politi and the centenary of his birth. 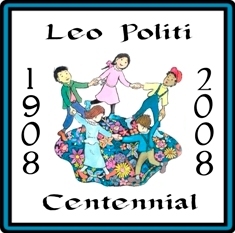 If you or your organization will be celebrating THE LEO POLITI 2008 CENTENNIAL and would like to have it listed on the leopoliti2008centennial.org website. Please let us know by emailing us at family@leopoliti.startlogic.com.